You are currently browsing the category archive for the ‘prices’ category. Is $100 oil far away? As gas prices dip below $2 a gallon in parts of the U.S., the question arises: will Americans be fooled? Not if they actually pay attention to the forecasts: “Although prices may stay low for a time, ‘it is becoming increasingly apparent that the era of cheap oil is over,’” says the Financial Times about a report to be released this week by the International Energy Agency, according to this report from IEEE Spectrum. The IEA forecasts oil back to $100 a barrel and up as soon as the recession-caused glut passes. Long-term, the IEA forecasts oil rising to $200 a barrel by 2030 – or it would forecast such a future, except that, in their words, “current global trends in energy supply and consumption are patently unsustainable.” As Bill Sweet of IEEE goes on to explain, “ultimately the IEA is saying that what it is predicting to happen will not actually happen because it cannot happen.” The IEA is acknowledging that you cannot just extend the graph out for another 20 years, that the reality the graph depicts derails the graph’s own underlying assumptions about prices, economic and population growth, and so on. This is a remarkable statement, and worth repeating: the world’s energy “business as usual” will not survive for two more decades, and the energy infrastructure as we know it will be changed by the turmoil caused by market pressures on oil supply. This of course is not news to those familiar with the World Without Oil game. But it is news to see it openly said by as august an agency as the IEA. Lesson: it’s not a moment too soon for the U.S. to embark on radical reconsiderations of its energy future (pdf). Photo by maistora via Flickr. It’s my last day of vacation here in Arlington, Vermont, where gasoline is $3.79 a gallon or so (it’s still over $4 back in Cali) and the winters are long and warmed with fuel oil. Our hosts had friends over last night, and I asked a man named Hamilton what the winter would be like. “Cold” was his laconic answer. At current prices, winter can cost residents here $6000 or more in fuel oil. Hamilton went on to relate that a fuel-oil supplier he knew was already carrying about $750,000 in debt from last year, when suppliers faced customers unable to pay who are facing freezing temperatures. Who will step in this year, I wonder. And the next, and the next. Meanwhile, an article in the New York Times describes how schools across the nation are dealing with the triple whammy of skyrocketing fuel costs and more foreclosures and the recession: cutting bus service; cutting hours (and in some cases, days); restricting travel; generally saving money any way they can. “The big national picture is that food and fuel costs are going up and school revenues are not,” said Anne L. Bryant, executive director of the National School Boards Association, according to the article. As the school year begins, teachers will be playing oil mini-crises with their students in their classrooms, using the World Without Oil lesson plans. Students not of driving age may have difficulty relating to gas prices, but underheated houses and four-day school weeks will connect them more directly, alas. In the World Without Oil game, the players imagined what would need to be done if petroleum suddenly became more expensive or otherwise hard to get. In the game, the players wrestled with cutbacks of essential services. What does it say that schools across the country are going to four-day weeks? 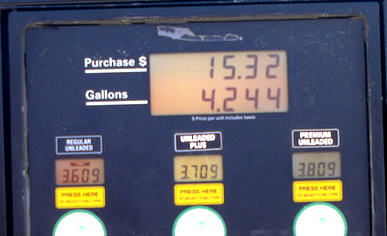 The oil crisis of 2008 continues. Photo by bitzcelt via Flickr. Drill Here. Drill Now. Pay Less. Strangely, he doesn’t mention that Drilling Here will net a nationally insignificant amount of oil, Drilling Now won’t yield that insignificant amount of oil for 8 or 10 years, and the Less we would be Paying would be about six cents per gallon. He also neglects to mention that we would be drilling in ecologically sensitive areas and all the profit from drilling would go to oil companies. Too bad this isn’t the World Without Oil game, where our hardheaded players put a natural check on unsupported, unsupportable emotional fantasizing. And now I pick up a letter from the CEO of United Airlines, urging me as an airline customer to support efforts to curb oil speculators, whom the airline industries define as people who don’t actually use oil, i.e. people who are not them. I guess I can understand why the airlines would want to get the other bidders in the room out of the room, but would that really lower oil prices? Oil futures are different from other commodities futures: owners can’t sit on oil, to drive up its value; just because you pay more doesn’t mean it’s worth more; when the contracts come due, speculators need to sell their oil futures to someone who actually uses oil. If at that point the speculator paid too much for the oil, they take a loss. (We may see speculators taking such losses later this year, in fact, if oil prices don’t rise again.) Again, too bad this isn’t the World Without Oil game, which naturally invoked collective intelligence to examine claims such as the United Airlines letter for accuracy. But then again, maybe this letter actually supports the World Without Oil results; in the game, the airlines couldn’t adapt to the abrupt rise in oil prices, made bad decisions and went bankrupt. At this point I am reminded of Jane McGonigal’s keynote at SXSW: Reality Is Broken: Games Can Fix It. In it, she listed four ways in which games do better than reality in generating happiness. I think that World Without Oil adds a fifth point to her roster: Games don’t reward people for sloppy play. Photo by Now and Here via Flickr. Another WWO pre-ja vu moment this week, reading this article by Megan Stack of the LA Times about Hugo Chavez’ visit to Russia, and what can only be described as the petro-drunk antics that he and Vladimir Putin indulged in. The two oil-rich nations signed energy security agreements, oil business deals, and arms deals, and expressed a common interest in establishing the ruble as a major reserve currency, replacing the dollar. The two spoke of Fidel Castro and waved off a report that Russia would begin to use Cuba as a base for nuclear-capable bombers. These real-world actions mirror what players of the World Without Oil game foresaw as happening: the rise of a new world petro-order. And just to slam the point home, read this article by Norma Love about New Hampshire’s abrupt u-turn regarding Venezuelan oil. The upshot: for a number of years Chavez has offered free oil to keep America’s poor warm in the winter; New Hampshire has refused it on principle, led by Republican Senator John Sununu; except this year, not so much. “Live Free or Die,” except when it’s oil. Made poignant by the fact that Gracesmom, probably WWO’s most beloved character, was a young single mom living hand-to-mouth in New Hampshire. The turn of events points up something else that WWO got right: the government’s paralysis, and especially the Administration’s. Looking at the dive in oil prices the day after Al Gore issued his energy challenge only serves to highlight how unable the Administration is to generate any vision of a way forward. Thanks, Laurel, for the lead! In the oil shortage chronicled by the players of World Without Oil, the resistance to telecommuting quickly went by the wayside, so to speak. Employers were eager to relieve their workers of the commute burden – infinitely preferable, in their eyes, to helping them with their fuel bills. Can employee telecommuting and virtual business travel be far behind? Thanks to loyal reader Laurel for the tip. Photo by wrumsby via Flickr. One of the key lessons of the World Without Oil game: oil is everywhere and in everything, and once you start interrupting its flow, weird things start to happen. They can be little things at first, but as seen from the boots on the ground, little unpleasant things add up quickly to koyanniqatsi, a life that must be lived differently. An example: gasoline theft. If it happens once, you grouse. If it happens four times, you stop buying gasoline. Another example: food prices. Milk goes up: you grouse. What do you do when the price of everything in every store is going up (but your income isn’t)? Well, some people are going to start stealing gasoline. 250,000 barrels a day – to put this number in perspective, it’s the amount that the Cantarell oilfield in Mexico declined in the last six months (and its decline will continue). It’s the amount that North Sea oil fields declined in the last year (and their decline will continue). It’s the amount taken offline recently when rebels in speedboats attacked an oil rig off the coast of Nigeria. It’s a little over 1% of our current oil consumption and maybe a third of a percent of the world’s. It’s spit in the bucket. Meanwhile, conservation methods offer us a way to reduce our dependence on oil by as much as one-third. That would be 28 times as great an effect. Twenty-eight times. We wouldn’t have to spend anything, or spoil anything, to do it. We could start right away, rather than waiting 10 years. And perhaps most tellingly, it would be a benefit that actually accrued to squeezed U.S. citizens, rather than a benefit that accrued to oil companies and whoever will bid the highest for the offshore oil. It’s what the other developed nations of the world have done. Maybe we should take advantage of the research they’ve done in this area? Or must we live through the World Without Oil scenario first? In the public forums you often hear concern expressed about “the economy” – what will we do to “the economy” if we take measures about changing our energy systems, if we take action about climate change, etc. And to measure what’s happening to “the economy” people invariably use the Gross Domestic Product, or GDP. But as Jonathan Rowe spells out in a speech to Congress, the GDP was never intended to be used in this way, and actually the guy who developed it warned – nay, begged – government never to do so. But that warning went unheeded and now here we are: as Jonathan shows, the hero of “the economy” is someone with a heart condition going through a bitter divorce, and the villains are people who conserve, grow their own food and share with others, care for their own children, and so on. Where GDP really gets it wrong, however, is when it tries to assess a resource such as oil. Its accounting is unable to apprehend the idea of limit or depletion, so again in Jonathan’s able phrase, it’s like a fuel gauge that reads fuller and fuller as it empties. I can’t help but think of the historical lessons in Collapse, the book by Jared Diamond, in which this sort of negative feedback loop spells doom for previous human civilizations. Take a few minutes and read the transcript of Jonathan Rowe’s speech (pdf). And thanks to Harper’s Magazine, which published the speech in its June issue (subscription needed). Photo by wallyg via Flickr. Just in time for summer vacation, the Manitoba Teachers Society has prepared a gameboard with 66 great web destinations (and World Without Oil is one). Fun! Edify yourself – visit all 66! I’m mulling this morning over the similarities between the subprime mortgage crisis and the high fuel price crisis. Both strike me as little garden paths that the unwary were led along, by people willing to make a buck over the inability of others to visualize the future. In both cases, people were sold a dream of the unaffordable made affordable, and sold the products that go with it: big new homes in the suburbs and plush low-mpg vehicles to make their long commutes comfortable. Now however the payment rates are being radically readjusted and the balloon payments are coming due. The purveyors of this dream – the subprime lenders of U.S. energy policy, the oil and auto companies and others aided and abetted by a subprime administration – are escaping with their gains and leaving people made destitute by their deception. What’s needed is action that materially reduces our dependence on oil forever – higher fuel efficiency, plug-in hybrids, alternative energy. Solutions such as drilling for more oil are merely a continuation of the cruel deception. For starters, it will take about 10 years for any new well to actually produce any oil – no help whatsoever to those being squeezed hard right now by high fuel prices. But the main point is: more oil, from any source, amounts to no more than taking out a second mortgage on a subprime energy policy, something that only puts the inevitable foreclosure off another year or two. Photo by DigitalHowie via Flickr. Click through for his narrative that sounds eerily like World Without Oil. All rights reserved by DigitalHowie. “A top Ford Motor Co. executive urged the government to make a greater commitment to the development of plug-in hybrids on Wednesday… Mark Fields, Ford’s President of the Americas, said at a conference on plug-in hybrids that bold incentives are needed to speed up the development of advanced batteries that are key to the green vehicles….’This is a race we absolutely must win,’ Fields said,” then went on to say, ‘It seems clear that a business case will not evolve, in the near term, without support from Washington.’ Hunh? Meanwhile, in an adjacent article, Toyota’s president Katsuaki Watanabe demonstrated a plug-in hybrid car, with a next-generation lithium-ion battery, at the Tokyo Environmental Forum. Toyota said its plug-in hybrid should be in the U.S. market by 2010; last year, Ford estimated its time to market at 5-10 years, or presumably never, if the government doesn’t help them out. Perhaps, if Ford had diverted one-tenth of its marketing budget for SUVs to hybrid research over the last 5 years, it wouldn’t be in such an embarrassing palm-out situation today? Bold never quits, but apparently it’s not above whining. And cutting pay and jobs; Mark Fields announced a 15% cut for white-collar workers last week. More reverberations of WWO themes, from AP articles on Thursday. So said Peter Carroll, a representative for the trucking industry in the UK, about fuel prices, shortly after he parked his big rig on the A40, closing that major artery into London. The blockades are beginning again in Europe, in a manner prescient of the Petrol Wars of 2000, which pretty much shut down France and the UK at that time. The problem is this: ordinary citizens can adapt to rising fuel costs by using transit or cutting back miles driven. But truckers, fishermen etc. have no such elasticity to their lives, and now that diesel is near $10 a gallon they’re not about to suffer alone. Which brings up the question: when can we expect renewed blockades and truckers’ strikes in the US, where truckers are similarly stretched past the breaking point? Expect no warning, as these events, loosely organized by CB and cell phone, are classic flashmobs. An article by John Wilen in the Business section today talks about how airlines are slowing down to save fuel. Meanwhile, Gary Richards, our local reporter on commute and traffic, advises his readers to stop whining about fuel prices and slow down – by his calculation, dropping one’s speed from 75 to 60 mph is like paying 30 cents less per gallon at the pump. These articles bring out another finding of the World Without Oil game – that oil = speed. Americans consume an inordinate amount of oil largely because we don’t like to wait – for the bus or the train, for example, or for that cool new weight machine we ordered online. 747s fly everywhere loaded with cargo that could be sent vastly more efficiently by boat or train. Photo by Lex in the City via Flickr. Was this not a game? Was World Without Oil indeed a look at the shape of things to come? “It’s like there’s no end in sight. It’s very scary,” one farmer says. The cause? Competition for fertilizer from China, India and other rapidly growing countries – and the rising cost of petroleum energy, which in turn is diverting natural gas from fertilizer manufacture into (more profitable) use as fuel. As we’ve already seen with corn-based ethanol, our demand for energy won’t stop even if it means less food for the table. And make no mistake, there is less food for the table. “Global food prices surged 57 percent last month from a year earlier, according to the United Nations, and the World Bank warns civil disturbances may be triggered in 33 countries,” reports Bloomberg.com. “Recent weeks have seen Philippine authorities scramble to augment rice stocks in the country, Indonesian officials warn of possible social unrest due to skyrocketing prices for basic foodstuffs, irate Egyptians protesting bread shortages, and international food aid programs unable to buy enough goods to meet their food distribution targets for vulnerable populations,” Voice of America reports. “This is the world’s big story,” said Jeffrey Sachs, director of Columbia University’s Earth Institute, reports CNN. Doesn’t this sound like WWO? The alarming dependence we have on oil in order to grow our food was one of the major themes of the World Without Oil alternate reality game, and explored in depth by our players. We use oil to plant our food, to fertilize and pesticide it, to harvest it, refrigerate it and transport it great distances. We use oil to truck in its pollinators and pump in its water. Irrigation lines, row cover, and other essentials of the farm trade are made from oil. In the game, when the price of oil jumped up and its availability went down, the price and availability of food inexorably followed. What to do? Get educated, especially about local sources of food. One of the WWO Lesson Plans can help. Meanwhile, oil hit $117 a barrel, and experts say oil prices may remain high even if demand begins to fall. Photo by mattlemmon via Flickr. Across the country, truckers are beginning to engage in roadblocks or rollingblocks to protest the squeeze caused by high diesel prices, now over $4 a gallon nationally. Independent truckers in particular (1 out of 10 trucks is an independent) have been caught without a mechanism in place to compensate for rapidly rising fuel costs, and for them rolling down the road has become a lose-lose proposition. The alert “WWO Lives” reader will flash back to this post on this blog and wonder just how deep this resentment runs, and how far this protest might go. I’m in Phoenix, looking for WWO-worthy headlines in the Arizona Republic, and finding them. Front page box item: “Gas prices continue to top records.” The box blurb mentions an Iraqi pipeline bombing and cutbacks by refiners as causes for the inexorable march of gas prices, but of course that’s hogwash (the pipeline will be fixed in the next day or so, and the cutback by refiners is due to shrinking gasoline demand in U.S. local markets). The article itself (top story, Business section) barely mentions the true cause: oil prices still over $105 a barrel. They spend a whole paragraph talking about the refinery cutback, terming it “troubling,” but why? Refineries cut back when local demand lessens, nothing sinister about it. World demand isn’t decreasing, not if China has anything to say about it, and as long as that’s true the fundamental price of oil will stay high. The rest of the article is quotes from drivers, and it’s all pure WWO: “Gas prices have really impacted our budget.” “We might not be able to take a vacation this year.” “I’m taking the bus and riding my bike more.” “I used to go back to Chinle, my hometown, every two weeks – now with higher gas prices, I only go up once a month.” Is this not a game? Revealing AP article today by John Wilen, highlighting the trouble that US consumers find themselves in today: gas prices are going up, no matter what. And increasing fuel costs mean that the price of everything goes up, no matter what. Under price pressure from all sides, US consumers are “combining errands, sharing rides, eliminating pleasure trips and using public transit more” in an effort to control the cost of fuel on their budgets. But what’s not happening is any decrease in fuel prices commensurate with the decline in fuel usage. Gas usage is off by 1% in the past 8 weeks, instead of its usual 1.5% growth (to keep up with population growth). But gas prices have only retreated by a few cents in recent days. The result: a father in Pleasanton, CA, is considering cutting swim lessons for his kids. Which may not seem like much, unless you’ve played World Without Oil and recognize that this is how it all begins. Real Life headlines from just the past week. Thisisnotagame? …the price of gasoline in the U.S. broke records, pushed higher than it’s ever been by the high cost of oil (now at $110 a barrel) and the ever-weakening dollar. “Analysts see little reason for the dollar to stop falling, or for oil and gas prices to stop rising, any time soon.” “Strong global demand for oil will keep prices high despite a downturn in demand in the U.S., two prominent forecasters warned.” Was this not a game? Price of a gallon of regular gas in Gorda, California: $5.19 a gallon. I’m just sayin’! 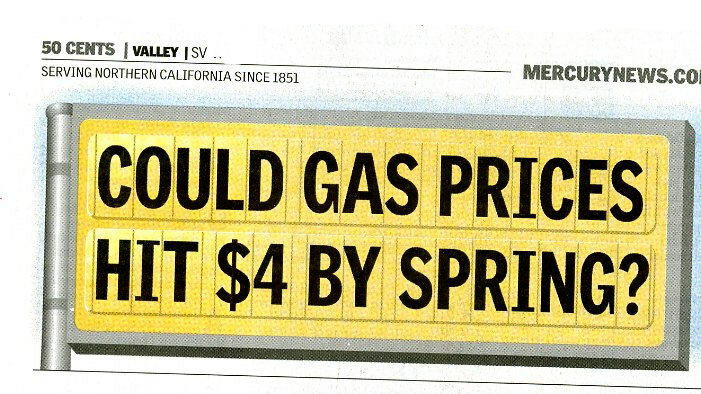 Presented without comment, from the front page of the San Jose Mercury News.